The thing about trilogies is that they always have that “middle chapter” — the one that has to do its own thing while serving the arc it’s in the middle of. Writing one is always a challenge, and Ryk E. Spoor is here today to tell you how he’s managed it with Demons of the Past: Revolution. The Demons of the Past trilogy (Demons of the Past: REVELATION, REVOLUTION, and RETRIBUTION) is probably the most complex work I’ve yet written. To an extent this is because I’ve spent more time on it than anything else – the first draft, originally simply titled Psionic! was written in 1978 and I’ve updated, redrafted, and enlarged upon it for decades since. It takes place in the same writing multiverse as Paradigms Lost and the Balance Sword trilogy (Phoenix Rising, Phoenix in Shadow, and Phoenix Ascendant), and is one of the most personally important stories I’ve yet published. The trilogy is a complex game of strategy and manipulation with the only chance for the good guys to win really resting on three words sent from one person to the other – and even that only gives them a chance. That setup occurred in the first book, Revelation (from Double Dragon Press). At the end of Revelation, the main viewpoint character, Captain Sasham Varan (formerly of the Reborn Empire) was a fugitive from his own Empire because he knew that the Prime Monitor – right hand of the Emperor – was a monster with hidden and malevolent intentions, as well as viciously hostile psionic allies hidden across the Empire. Varan’s only allies were the mysterious trader called The Eonwyl, the R’Thann scientist Sooovickalassa (often called “Vick”) whose unique process had made Varan a psionic, and astrophysicist and warrior Guvthor Hok Guvthor. Varan’s best friend Taelin Mel’Tasne – a high-placed member of the Five Families that helped guide the Empire – had received and, to his horror, understood Varan’s cryptic, three-word message “Please trust me”, leading Taelin and his brother Lukhas (high in Imperial Security) to formulate a very desperate plan indeed. 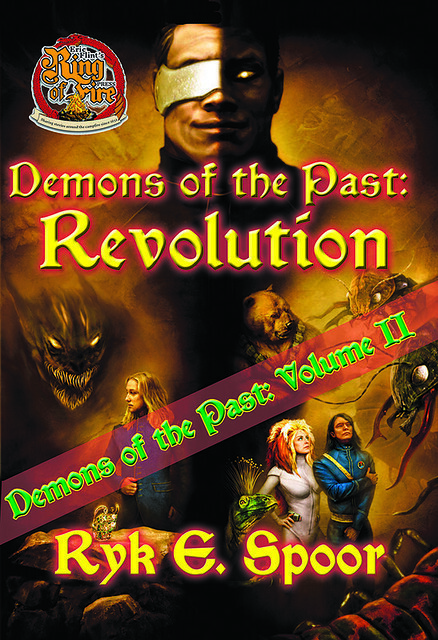 In Demons of the Past: REVOLUTION (from Eric Flint’s Ring of Fire Press), both Varan’s group and Taelin’s have to come to an understanding of what they are dealing with, and how they can do so, all while Shagrath’s manipulations bring the Reborn Empire closer to the brink of a galaxy-destroying war. The middle of a trilogy is always the hardest. In a prior Big Idea column, I discussed how I addressed some of those issues in Phoenix in Shadow, by essentially having a storyline for one of the major characters be concluded in that book, even if the true main plot couldn’t be resolved until the third book. But I couldn’t use that approach for Demons of the Past: REVOLUTION. 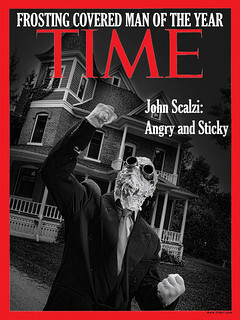 Unlike the Balanced Sword trilogy, the characters in Demons of the Past are all personally caught up in what is really one huge plot, which can be divided into three books based on the type of activity in each: Revelation is about recognizing the problems that are facing the characters; Revolution is about the characters coming to an understanding of those problems, their own capabilities and relationships, and how they must move forward; Retribution is about the characters taking that understanding and turning it into action. The separate character arcs are smaller, and contained within the overarching plot, in a way that prevents the admittedly more satisfying in-book resolution seen in Phoenix in Shadow. To an extent, that meant that Demons of the Past as a whole had to be focused on the characters more than any other book I’ve written. Varan, the Eonwyl, Taelin, Guvthor, Sooovickalassa, and even Shagrath had to be not merely clearly different, but clearly defined in a way that would allow the readers to say “oh. That’s right, of course this character would have to act that way”, because the characters’ behavior, beliefs, and personalities ultimately determine the success or failure of the major action in the trilogy. In a way, knowing the core purpose of the middle book, and the personalities involved, simplified the writing. I knew Varan’s group had to discover the nature of Shagrath’s allies the Kaital (the name they eventually learn), Shagrath’s true origin and name, and enough details about both to provide a foundation for defeating them. I also knew the characters themselves had to learn more about each other, and that key elements in that area were the Eonwyl’s secret past, the true history of the Thovians (Guvthor’s people) and of the R’Thann (Vick’s species), and Varan being threatened by a weakness (a phobia of Zchoradans and related species) that had been established early in the first book. In addition, we had to learn something about Taelin’s actions and plans, and about Shagrath’s true intentions, capabilities, and resources – and the latter should be terrifying indeed, or there’s not much tension to drive the book. None of this, of course, offered the same type of closure as the ending of Phoenix in Shadow. There were some high dramatic points the book could end on, but all of them amounted to some form or another of cliffhanger. On occasion, I’ve referred to Demons of the Past as being “Star Wars, if Luke had gone on to the Academy and only learned how rotten the Empire was when he’d been in service for twenty years”. Revolution, then, is the Empire Strikes Back of the trilogy. It has to end with the characters in it deep, no matter what they’ve learned. It has to tell us what the magnitude and nature of the opposition is. And it has to leave the characters in a situation where they will be forced to act decisively. Ultimately, the latter drove the decision. The title of the book – Revolution – refers to the fact that Varan must accept that to save even a part of the Reborn Empire he will have to place himself against what it has become, and be himself a revolutionary, willing to bring down the star nation that he loves and that was his home and source of pride. This brings him full-circle back to his very first adversaries – the Zchoradan Meld, the only other star nation that can begin to rival the Reborn Empire. Varan must face his phobia and his own patriotism and overcome both to plead for the aid of his own people’s long-time enemies. That is, in many ways, the high (or low) point of the book, the understanding and acceptance of Varan of the course he must take, regardless of the personal cost. He must accept the consequences of his past confrontations with the Zchorada, and the propaganda that Shagrath has created to make Varan out to be a true monster, in order to convince his former enemies that they have – that they must have – a common cause. And that must end in doubt, not certainty. Taelin’s course, too, must be moved forward, and it struck me that it would be symmetry that he would do as Varan did, sending him a hidden message, but where Varan’s had been a message of subtle terror, Taelin’s would be one of hope – that also showed how fragile the hope could be. In the end, I think I succeeded as well as I might have; the course for our heroes is clear, if fraught with perils of many sorts, and the dénouement of the entire trilogy is (mostly) set up, in its elements at least. I hope readers will agree, and follow Varan through to the final volume (coming next year), Demons of the Past: RETRIBUTION. 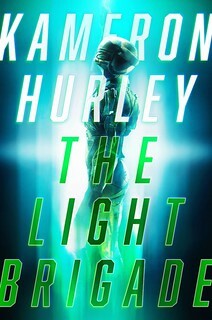 All well and fine except for the protagonist’s name. “Varan” should obviously be attached to a monitor. Bo Lindbergh: Wow, by this you’ve just made me understand the name of the Kaiju Varan; I never made the connection until now.